Grand Forks City Hall, 255 N 4th Street, Grand Forks, ND 58203; phone: 701-746-4636. Photo: Dr. Henry Wheeler House, ca. 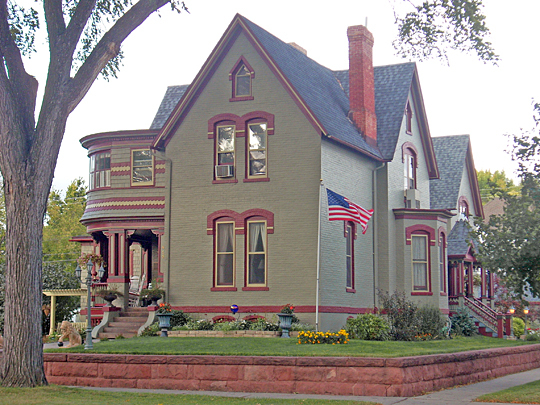 1884, 420 Franklin Street, Grand Forks, ND. House is believed to have been designed by N.Y. architect George Wheeler, Henry's younger brother. Listed on the National Register of Historic Places in 1986. Photographed by User:Glorioussandwich (own work), 2009 [cc-by-1.0 (creativecommons.org/publicdomain/zero/1.0/deed.en)] via Wikimedia Commons, accessed November, 2012. The City of Grand Forks, the seat of Grand Forks County, is named for its situation at the confluence of the Red River of the North and Red Lake River. The broad low profile of the city, dominated by the State Mill and Elevator and the radio station towers, is visible long before it is reached. Even the many trees do not obstruct the view, for they grow chiefly along the river, roughly paralleling the highway. Like other small Midwest cities, Grand Forks is a heterogeneous mixture of nineteenth century and modern architecture. The south part of town, along US 81 and its neighboring streets, is the finest residential district. University Avenue, lined with rooming houses and quiet homes, culminates in an architectural spectacle along Fraternity Row, an impressive group of houses vying for prominence and grandeur. Meat packing, milling, and processing of other agricultural products constitute the city's chief industries. The largest railroad terminal between St. Paul and Seattle, Grand Forks is headquarters of the Dakota Division of the Great Northern Railway, the largest division in the world, containing more than 1,800 miles of main line track. The Northern Pacific Railway and several truck lines add to the shipping facilities. The State university is not only a material asset of the city, but is a vital part of its intellectual and social life. University musical and dramatic performances are popular with townsfolk, college parties and proms are leading society events, and athletic contests draw a large attendance, not only from the city but from the entire northeast section of the State. It is thought that the early French-Canadian explorers of North Dakota may have given this site the name of Grandes Fourches; by that name it was commonly known to the French fur traders of the late eighteenth century. In 1801, under direction of Alexander Henry, Jr., John Cameron established a North West Company depot here. Where Henry's men traded furs with the Indians, Grand Forks stands, the second largest city in the State, and hub of a rich agricultural region in the Red River Valley. Nothing is known of the occupants of the first house in Grand Forks, a tumble down shack discovered by travelers near the shores of the Red River in the early 1850's. The site is now occupied by the warming house of the Central Park skating rink. In 1868 Nicholas Hoffman and August Loon, carrying mail from Fort Abercrombie to Fort Pembina, built a log cabin at the present corner of Eighth Avenue South and Almonte. They used it as an overnight shelter on the long trip across the prairies. Following his expedition by dog-sled through Dakota in 1860, James J. Hill, who later built the Great Northern Railway, sent Capt. Alexander Griggs to explore the Red River. By the fall of 1870 Griggs had built up a good freighting business, using flatboats to carry his cargoes. George Winship, later publisher of the Grand Forks Herald, also went into the flatboat freight business and a friendly rivalry developed between the two commanders and their crews. Captain Griggs built a squatter cabin at the mouth of the Red Lake River, and after a trip to St. Paul in 1871 built the first frame house in the settlement on the bank of the Red River, at the foot of what is now Kittson Avenue, and brought his family to the new community. In its early years Grand Forks was a typical river town, developing into an important station for the heavy river and oxcart traffic on the St. Paul-Fort Garry trail. Dwellings began to dot the prairie beside the river, log huts and crude frame structures built from the product of Captain Griggs' saw mill. A post office was established in 1871, and mail arrived once or twice a week by dog team. In the same year a telegraph station was established, on the first line in the State, running between Fort Abercrombie and Winnipeg. It was about this time that the English pronunciation of the community's name came into general use. In the winter of 1872 there was much unemployment and saloons were filled with idle men. During this winter "Catfish Joe," a half-witted Frenchman, murdered a local character known as Old Man Stevens who, while intoxicated, called him uncomplimentary names. The saloon crowd decided on a lynching, and all through the night plans were discussed, but with so many rounds of drinks that action was impossible. Catfish Joe was tried for murder at Yankton, spent two years in prison, and returned to terrify Grand Forks by strutting about the streets decorated with a bowie knife and a Winchester. One courageous townsman, Bert Haney, seized the gun and struck Joe a terrific blow on the head, breaking the rifle barrel from the stock, but with no damage to Joe's head Catfish Joe later went to Montana where he murdered his partner for refusing to get up in the night and prepare breakfast. By the spring of 1872 Captain Griggs' sawmill was doing a flourishing business, turning out lumber for building and repairing river boats and barges. Logs were cut and floated down the river to Winnipeg. When Frank Viets opened the first flour mill in the Red River Valley at Grand Forks in 1877, he added another industry to the growing settlement. The Hudson's Bay Company operated a store, managed by Viets, who purchased it when the company moved to Winnipeg in 1877. There was no dentist in the community in the early days of Grand Forks. Alex Walstrom, a blacksmith, used a pair of homemade tongs about two feet long to pull aching teeth. On October 26, 1875, Captain Griggs filed a plat of the original town site of Grand Forks, covering 90 acres of his claim. The following spring Viets filed the plat of his first addition. In 1879 the village of Grand Forks was organized and three years later was incorporated as a city. Although life at the little river post lacked many refinements, the social aspect was not entirely neglected. Weddings were carried out with pomp and ceremony, and anniversaries appropriately celebrated. A popular social custom, New Year calling, was introduced on January 1, 1876. Groups of men rode together in sleighs to call on their friends, and then drove to the Hudson's Bay Company store, purchased flour, sugar, tea, and other necessities, which they took to the homes of the destitute. Until 1879 traffic moved by steamboat or stage, but the coming of the Great Northern Railway in that year brought the rapid decline of both these early modes of transportation. Their end was hastened by the extension of the Northern Pacific Railway from Crookston, MN to Grand Forks two years later. George Walsh founded the Plain Dealer, the first newspaper northwest of Fargo, in 1874, and published it without competition for five years until George Winship started the Herald. There began a continuous quarrel between the two editors which was at times decidedly heated, although when the plant of the Plain Dealer burned in 1884 Winship shared his equipment with Walsh. While acknowledging the courtesy, the Plain Dealer continued to attack the editorial policies of its benefactor. Winship eventually purchased his rival's paper and merged it with the Herald, which since 1881 has been published as a daily. The late J. D. Bacon, when publisher of the Herold, established the Lilac Hedge Farm northwest of Grand Forks to demonstrate the practicability of diversified agriculture and the value of using pure-bred stock. Colonel Viets' mill on South Third Street was one of the first industries established in the city, and was the only flour mill until 1882, when John McDonald founded a mill at the present corner of Fifth Street and Kittson Avenue. This was operated later by the Diamond Milling Company and then sold to the Russell-Miller Milling Company. Cream of Wheat was first processed in Grand Forks and was manufactured locally for a number of years about the turn of the century, before the manufacturer moved to Minneapolis. In Grand Forks politics and the weather were of great importance. Elections were always exciting. When D. M. Holmes ran for mayor in 1888 his friend James J. Hill ordered all Great Northern trains of the north, south, and west lines to run into Grand Forks so that the train crews could vote for Holmes. Against such odds Holmes' opponent withdrew. A tornado that struck Grand Forks in June 1887 killed two women and wrecked many buildings. Ten years later the city experienced one of the worst floods in its history. The Red River made an all-time record by flowing four miles an hour. Houses along the river flats were floating or completely submerged. The piers of the west approach of the Minnesota Avenue bridge were swept by ice, and the Northern Pacific tracks were under water. When water filled the basement of the Herald building, the staff was forced to resort to hand composition to continue publication. Many families lived in second stories, and on nearby farms platforms were built on the roots of barns and fenced in for the livestock, which was fed from boats. In 1890 a brick plant was established in Grand Forks, and another in 1900. Other industries which sprang up during this period were bottling works, breweries, and foundries. Besides the Grand Forks Herald, two weeklies were established, the Red River Valley Citizen and the Normanden, the latter in the Norwegian language. In 1919 a group of farmers and business men from Grand Forks and the surrounding territory opened the Northern Packing Company, designed to handle 500 hogs and 150 cattle and sheep daily, with a plant one and one-half miles north of the city. The State Mill and Elevator began operation In 1922. A candy company that uses locally produced beet sugar has an annual output of about 1,000,000 pounds. A wee potato warehouse with laboratory and experimental department was constructed in 1935 at the corner of North Third Street and Lewis Boulevard. The population of Grand Forks has increased from 200 in 1873 to 17,112 in 1930, and is composed of many nationalities, although more than 75 percent of the native whites are of Norwegian or Canadian descent. A small section of the city bounded by Sixth and Eighth Avenues North and Twentieth and Twenty-third Streets North is a Scandinavian community designated locally as "Little Norway." Here Norwegian is spoken almost exclusively by the older people, although the children have acquired American speech and habits. Norwegian Independence Day, Syttende Mai (May 17), is celebrated by the residents of this district and their homes are then decorated with Norwegian flags. Much political activity of an earlier period centered about this little community, since it generally voted as a bloc. Politicians of that day believed that the candidate who was most liberal with ale would receive the community's vote, and on the eve of election torchlight parades marched through the streets of this district and candidates for office generously dispensed both oratory and beer. Works Progress Administration, Federal Writers' Project, North Dakota: A Guide to the Northern Prairie State, State Historical Society of North Dakota, 1938.